Booknotes & Journalists · Booknotes & Journalists · One Book. One Author. One Hour. A journalist himself, Brian Lamb welcomed fellow journalists into his studio to talk about their books and what went into writing them. Whether an author’s journalism career put them behind a typewriter, in front of a camera, or in the control room, he or she was a welcome guest on "Booknotes". The show featured such well-known figures as Morley Safer, Neil Sheehan, Peter Jennings, Dan Rather, Katherine Graham, Carl Rowan, James Reston, and Don Hewitt, just to name a few. 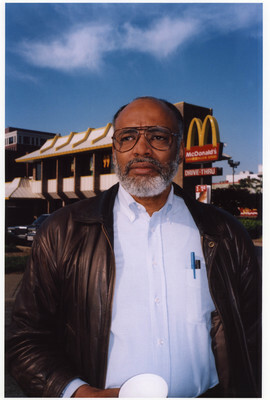 Leon Dash, professor of journalism at the University of Illinois at Urbana-Champaign, is shown here in front of a McDonald’s in Washington, D.C. This restaurant was an integral part of his book, Rosa Lee: A Mother and Her Family in Urban America. He frequently met Rosa Lee Cunningham there to interview her for the Washington Post. The eight-part article-series, which ran in the Post in 1994, won the Pulitzer Prize for investigative journalism. He discussed the story and subsequent book on "Booknotes" in November 1996. Nathan McCall, author of Makes Me Wanna Holler: A Young Black Man in America, discussed his March 1999 appearance on Booknotes in an oral history interview on August 14, 2014. In this interview McCall, a former reporter for the Virginian Pilot-Ledger Star, the Atlanta Journal-Constitution, and the The Washington Post recalled, among other details about his "Booknotes" experience, a humorous exchange with Brian Lamb in which McCall demonstrated the practice of “joning” or trading of insults with him. 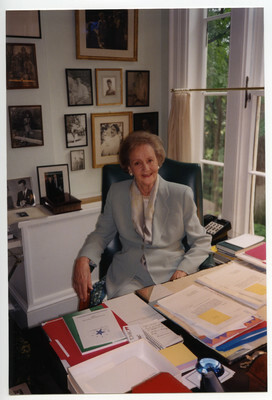 Katherine Graham, President, CEO, and Publisher of the Washington Post newspaper from 1963 into the 1990s, is shown here in her home office in Washington, D.C. As part of the "Booknotes" interview, Lamb often asked authors to detail their writing process, including where they wrote. During her interview in February 1997, in which she discussed her Pulitzer Prize-winning memoir, Personal History, Graham told Lamb that she compiled the book while in this office. 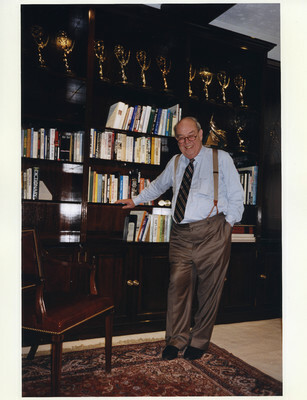 The late Charles Kuralt, a journalist for CBS News perhaps best known for his “On the Road with Charles Kuralt” series, is shown here in his office in Manhattan. When asked by Lamb where he wrote, he replied: “since leaving CBS, I knew that I didn't want to hang around the house all day, so I have rented a writing room on top of a building in 57th Street in New York and fixed it up to look ...like a seedy, failing, small gentlemen's club.” In this photo Kuralt’s ten Emmy Awards can be seen on the cabinet behind him. During an oral history interview on October 23, 2014, Jon Katz, author of Virtuous Reality: How America Surrendered Discussion of Moral Values to Opportunists, Nitwits and Blockheads Like William Bennett, discussed his March 1997 "Booknotes" interview with Brian Lamb. He recalled being surprised by Lamb’s impartial interview style. Katz, who was previously a reporter for The Philadelphia Inquirer, The Boston Globe and The Washington Post, considered it a refreshing change for that period of time. He suggested that media outlets descended into a “culture of argument” where organizations were beginning to form rival camps of opinion.